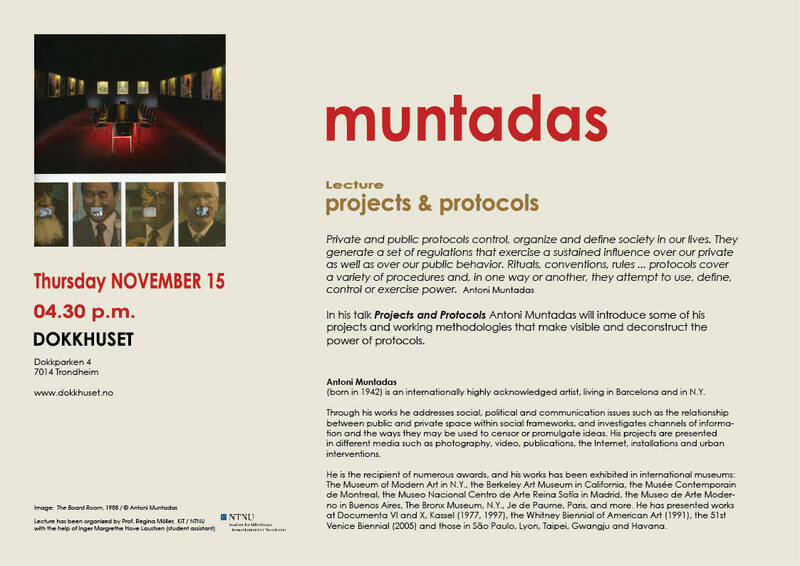 Guest Lecture: MUNTADAS "Projects & Protocols" at Dokkhuset, November 15 at 4.30 p.m.
Public Talk at Dokkhuset, Thursday November 15, 4.30 p.m. In his talk "Projects and Protocols" Antoni Muntadas will introduce some of his projects and working methodologies that make visible and deconstruct the power of protocols. (born in 1942) is an internationally highly acknowledged artist, living in Barcelona and in N.Y.
in different media such as photography, video, publications, the Internet, installations and urban interventions. He is the recipient of numerous awards, and his works has been exhibited in international museums: The Museum of Modern Art in N.Y., the Berkeley Art Museum in California, the Musée Contemporain de Montreal, the Museo Nacional Centro de Arte Reina Sofía in Madrid, the Museo de Arte Moder- no in Buenos Aires, The Bronx Museum, N.Y., Je de Paume, Paris, and more. He has presented works at Documenta VI and X, Kassel (1977, 1997), the Whitney Biennial of American Art (1991), the 51st Venice Biennial (2005) and those in São Paulo, Lyon, Taipei, Gwangju and Havana.